The AquaBound Sting Ray Carbon kayak paddles are designed to provide superior performance with low swing weight by combining a carbon shaft with carbon abX blades. The Aqua Bound Sting Ray Carbon Kayak Paddle in all carbon is a lightweight, all-purpose paddle with a blade shape that is silky smooth through the water. Carbon reinforced abX blades and carbon shaft give this paddle an incredibly low swing weight and is unbeatable at this price! Available in standard and small shaft. Great paddle! I'm 5'2" with average size hands for a woman. I purchased a 210 cm small shaft and am very happy. It's light weight, super easy to handle, and gets me where I want to go. I'm going to order a larger paddle to have for others who may use my kayak sometime. Shipping was quick. I bought 2 of these paddles and have used them several time during my first summer of Kayaking. I appreciate the light weight carbon fiber after paddling for several hours at a time. I would like to see the price drop some more as we all would. Happy with my purchase overall. This paddle is light as air, very stiff, and paddles like a dream. Very efficient. Great performance for a budget price. Excellent paddle and a great value for a carbon fiber paddle. Even though it is only about a pound lighter than my other paddles, I can feel the positive difference after only a few minutes of vigorous paddling. 5 Stars! Light and nimble! Paddled 4 hours and was hardly noticeable. I would highly recommend spending a few more bucks to have this awesome paddle! AquaBound Sting Ray Carbon Kayak Paddle. I am completely pleased with this product. It came fairly well packed, and as its carbon fiber, probably didn't need to be packed like a highly breakable object. It has been used twice, second time for a 2.5 hour paddle. Works well, very light, excellent grip on the handle, and drip rings ward off most water. I would recommend this product. Great paddle. Strong and light as a feather. Just what I was looking for in a kayak paddle! very light and durable. I have two version of the stingray. This new carbon fiber and my older fiberglass version of the stingray. This is noticably lighter but what I liked most over the fiberglass version was its stiffness. Get a much better tranfer of energy forward to the kayak with the carbon version over the fiiberglass version. I think its the stiffness of the blades themselves not so much the shaft of the paddle but the stiffer blades on the carbon paddle. Worth the extra money, glad I upgraded, Oh get it here, try to by this locally you will pay almost double what Austin sells it for. Very nice paddle, lightweight and well-made. goes together easily. ACK had the shorter length paddle in stock that I needed, and could not find elsewhere. This is my first really good quality paddle. Now I know why theyre more expensive. It is lightweight and the blades really slice through the water and propel the boat with minimal effort. I will be buying another paddle. Awesome paddle! Lightweight and slick! Like others have said it is very light. I think this is the cheapest carbon fiber paddle. For the price it cant be beat. Plus, the carbon fiber looks cool. I bought the Aquabond Sting Ray Paddle for my wife. We acquired a 12 Perception Carolina and she needed a new paddle. The Sting Ray was extremely light, yet durable. The paddle has a solid feel to it even though it is lightweight. We spent the day paddling the coast of Long Island Sound, which has a fair share of tidal current and wind and she lasted all day without major fatigue. This is my 3rd Aquabond paddle and I have been very pleased with all. The first 2 are still in service. For a midrange price, I would highly recommend this paddle. Last weekend we used the Aquabound Sting Ray paddles for the first time. It may sound stupid, but they are so light that they were hard to get use to. We paddled for about an hour before we got our rhythm down and didnt lift them too high out of the water. We paddled two hours and didnt notice any fatigue from the paddles themselves. The shafts are easy to grip and hold for a long time with or without gloves. I would buy them again. This is my 2nd Aquabound sting ray paddle the first was for the wife and her reviews were 10s across the board..and I agree, after receiving my 240 the fit was perfect,light weight and the oval shaft kept the paddles were they should be all the time. The adj. ferrule is perfect if feathering is needed. use it on the flat water and in the 3' lake MI cresting rollers, works great in all conditions, just gotta dig a little harder/deeper when it is blowing 17 knots. i really like the oval shaft, positions the feather perfect, especially in the windy conditions. top that with excellent service and shipping fast from ack. Been using the paddle about a month on flat water (lakes). Works well. Light. No complaints. Everything I want in a paddle. This paddle is well made and very light, and the TLC ferrule mechanism for adjusting the feathering angle works great. I would highly recommend this paddle, especially for touring and lower angle paddling. Love this paddle, secure and virtually flex free 2pc construction, paddle blade has great bite for a powerful high angle stroke, and nice thin but strong feathered blade for ease of entry and exit. Nice and light with the carbon shaft. Very happy with my purchase. VERY LIGHT AND STURDY. I WILL PROBABLY BUY A SECOND ONE FOR A BACKUP. Great product. Excellent service from the by sales rep.
A: For your size and the width of the boat I would recommend a 230 cm. shaft. If you ever have questions regarding paddle sizing, please give us a call at 888.828.3828. Q: I am 5'8" in a Old Town Loon 126 what size would you recommend? A: I would recommend a 240cm for your height and the width of your kayak. If you do more of a high angle paddle stroke then you could probably get away with a 230cm, but I believe the 240 would be best. 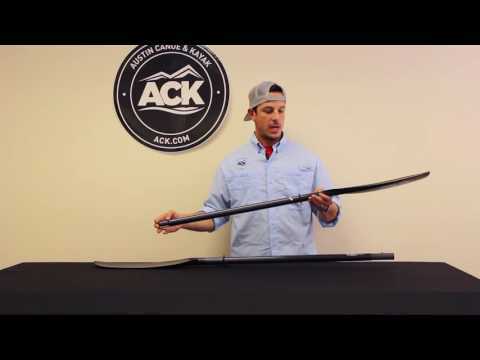 Q: What would be the difference between a small shaft paddle and a standard shaft paddle? A: The small shaft will have a smaller shaft circumference, which we would recommend to paddlers with smaller hands. A: Generally speaking I would recommend a 230 cm paddle if you're 5'11" or shorter. Q: What size should I purchase? Kayak is Wilderness Systems Tsunami 135 Kayak and am 5' 2" should I consider small shaft? A: I would say for this kayak the best paddle length would be a small shaft 220 cm.